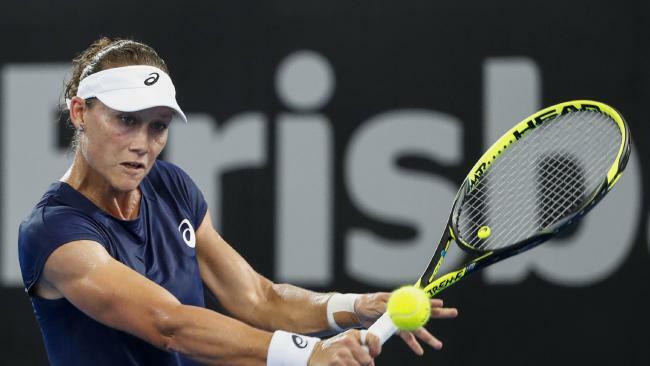 SAM Stosur knows she is in for a battle of aggression on Margaret Court Arena on Monday. The Queenslander will take on Puerto Rican Olympic gold medallist Monica Puig and while she said she is anticipating being "up against it" at times, she can be the one to take her moments of opportunity when they present. "She's a dangerous player," Stosur said. "She's got a big game and plays with lots of aggression and lots of power. I know that I'm going to be sometimes up against it and I'm going to feel that. "But I've also got an aggressive game and I know that it's probably going to come down to who can play good, first-strike tennis and play big in those bigger moments and really take advantage of any opportunity. "They're all hard, first rounds in the slams - they're never easy. But I think my tennis can match up well against her." After fracturing her hand during the French Open, the Queenslander didn't play a WTA match for more than three months last year. She knew there had to be a silver lining, and managed to find it in spending time with her family and even enjoying periods of hiking as she prepared for a trip. The enforced layoff was anything but ideal. But it only increased the 2011 US Open champion's hunger to make the most of what she hopes is a bumper 2018. "You've got to look at (the layoff) in more of a positive way than negative - it's not a position I would have chosen to be in, but it was a good opportunity to freshen up, take a break, do some more," Stosur said. "I did a whole heap of training off the court when I couldn't do anything with my hand. When you're given that sort of situation, you've just got to do what you can do. "I got to spend a bit more time at home than almost every other player, so that was good. I'm certainly looking forward to getting away with this year coming and hopefully playing a whole schedule, be injury-free and get back to it. "You've got to make the most of sometimes what gets laid out to you and I think that's what I did." A second-week berth at the Australian Open is a goal for Stosur, whose previous best showing was the fourth round in 2006 and 2010. "My results here in Australia … they're a challenge for me sometimes," the 33-year-old said. "But I just want to keep trying to play well and I feel like I've done what I can to put myself in a good position. I've just got to go out there and enjoy it and go for it and try and play the way I know I can play. "If I do that, but I lose, then so be it. But I just want to take care of the stuff that I can, and hopefully that means lots of wins but time will tell."